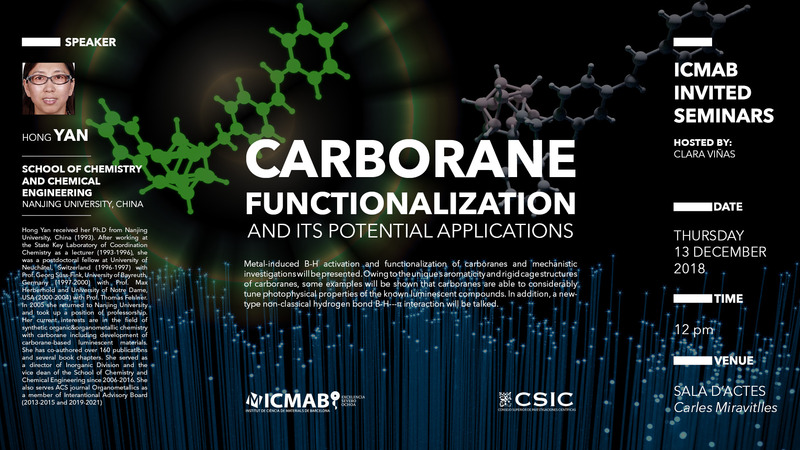 Metal-induced B-H activation and functionalization of carboranes and mechanistic investigations will be presented. Owing to the unique s aromaticity and rigid cage structures of carboranes, some examples will be shown that carboranes are able to considerably tune photophysical properties of the known luminescent compounds. In addition, a new-type non-classical hydrogen bond B-H---π interaction will be talked. Hong Yan received her Ph.D from Nanjing University, China (1993). After working at the State Key Laboratory of Coordination Chemistry as a lecturer (1993-1996), she was a postdoctoral fellow at University of Neuchâtel, Switzerland (1996-1997) with Prof. Georg Süss-Fink, University of Bayreuth, Germany (1997-2000) with Prof. Max Herberhold and University of Notre Dame, USA (2000-2004) with Prof. Thomas Fehlner. In 2005 she returned to Nanjing University and took up a position of professorship. Her current interests are in the field of synthetic organic&organometallic chemistry with carborane including development of carborane-based luminescent materials. She has co-authored over 160 publications and several book chapters. She served as a director of Inorganic Division and the vice dean of the School of Chemistry and Chemical Engineering since 2006-2016. She also serves ACS journal Organometallics as a member of Interantional Advisory Board (2013-2015 and 2019-2021)..